When it comes to punishingly difficult games, they are a type of game that I can’t go without, the satisfaction of finally beating that one seemingly impossible boss is unmatched by any achievement received from beating a linear chapter of a conventional shooter. Which is why I completely embrace the idea of more of these hard as nails “play until you master” type of game. Which has made me excited when I saw the trailer for Oniken, an action game in the same vein as games like Strider and adopt an 8-bit style similar to the recently released Megaman 9 and 10. 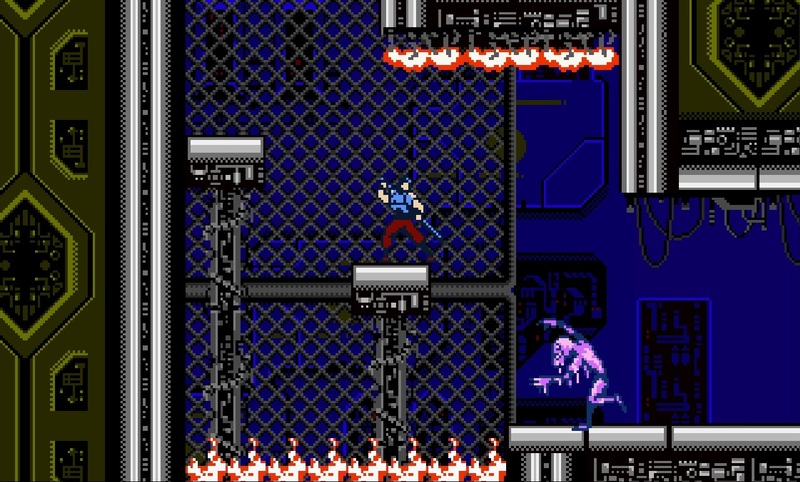 Gameplay in Oniken is a difficult run through 6 missions with a few mid-bosses and a final boss to conclude each mission and a few checkpoints in between. 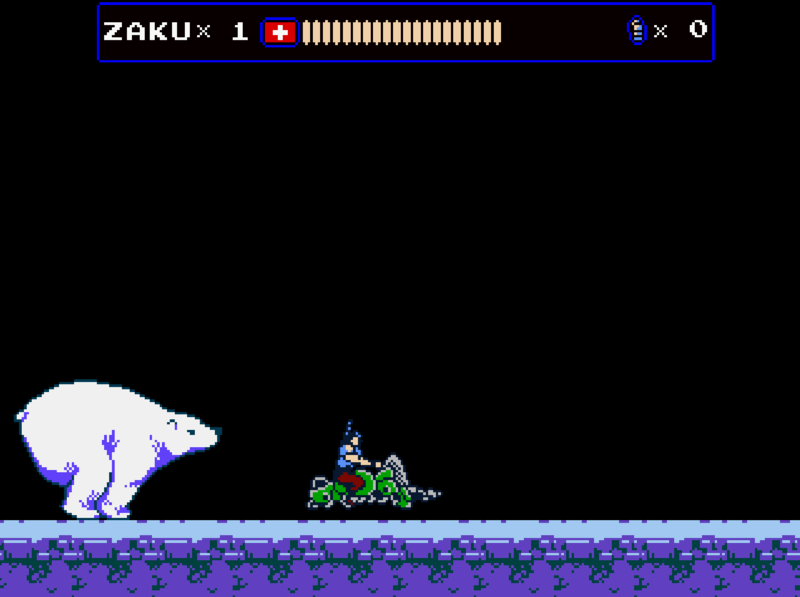 The game gives you 3 lives per mission and you have a health bar that can be replenished with pickups. The game may seem frenetic at first but then you realize that being slow and methodical will mostly keep you alive. Powerups for your sword can also be picked up to improve the range of attack and grenades are extremely helpful and kill most enemies in one hit. I commend the game for its fair difficulty curve and tight controls that ensure that if you died, it’s probably your own fault. One gripe about the gameplay is that bosses seem to have no recovery time after each attack you deal to them so some bosses can be beaten by hitting the attack button as fast as possible which seems to remove a lot of the challenge with the bosses. Speaking of bosses, it’s a mixed bag, some bosses are large static targets that you hit when the game tells you to, other times they are awesome Megaman style bosses that you need to expertly maneuver around to successfully beat. The 8-bit style of the game is spot on, I love the generic action movie style the game adopts and it adopts it well! From the intro of the game with a cheesy story of beating the evil doers to mid-game cutscenes similar to Ninja Gaiden with supplemental story given to enhance that 80’s action flick feel. 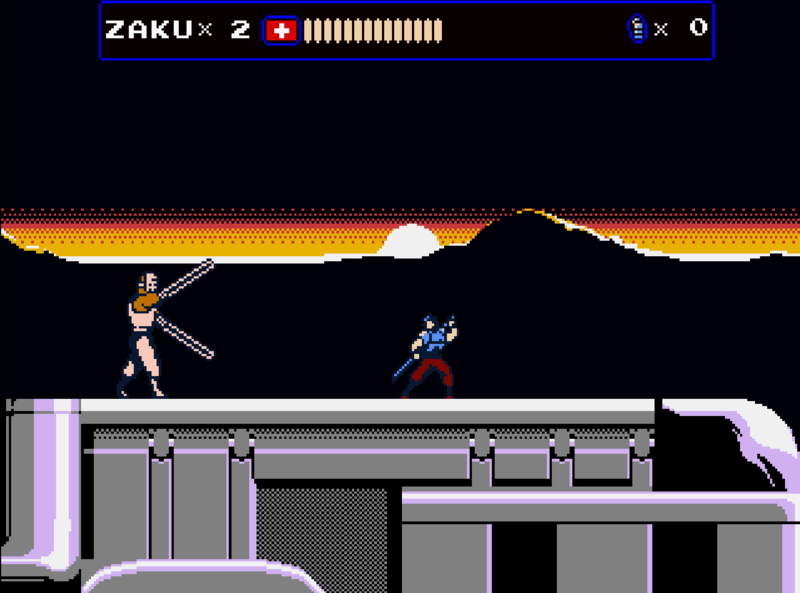 Each stage is themed effectively with stages like a snow level with underground snow caverns and most interesting is being on a moving train fighting enemies as the sun sets behind you. With any 8-bit game, be it resurgence or an original NES game, a pumping soundtrack with amazing music is to be expected. This is where Oniken falls a bit short, most levels have a pretty good soundtrack while being nothing special, a shame since a lot can be done with chiptune to make the game memorable such as the game VVVVVV which has one of the best soundtracks I’ve heard from a recent game. Some levels like the first mission have a music track that seems out of place, and that can really hamper the experience of game like this where music is a lot of the appeal. When it comes to replayability, there doesn’t seem to be multiple difficulties so one run-through is all you are getting from this game. Although it is aptly priced at $5 on Desura and for that asking price it is totally worth it since you will get a few hours of playtime thanks to the difficulty. 2 Comments on "Oniken Review"
Awesome review, I know exactly what you mean about hard games. I personally hate things like a simple ‘difficulty slider’ that does nothing but increase or decrease enemy damage/ health. Amazing game. Already bought it on Desura. It has some nice extras like a Manual (full of illustrations – I love this kind of manual), Poster and the Soundtrack. A ‘must have’ if, as Bob said, you like “…8-bit fans and gamers wanting a good challenge…”.